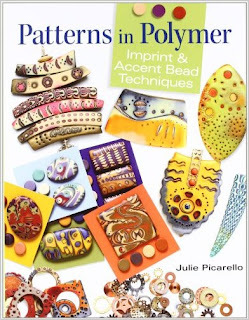 I really enjoyed reading Julie Picarello's book Patterns in Polymer and looking at all the beautiful pictures, but I didn't think much more about it since I'm not a polymer person until Polymer Clay month came around again on Beading Arts! How's that for motivation? Now, when you see these crude cabochons and beads I made, please don't blame Julie...her work is exquisite, as you can see on the cover of the book. And read my review; I've got a shot of some more of her work there. But I was influenced by her methods, so I have to give her credit even though she will probably cringe if she sees these! One of my main downfalls is that I didn't really follow her directions, and I certainly could have chosen nicer colors. Also, I do not have a pasta machine, so my clay layers were very uneven. Nonetheless, these were still a lot of fun to make, and I could see a lot of potential in the method. And I will use them in a project, for sure! 1. I made a four colored stack of thin polymer sheets and imprinted them with several different tools. 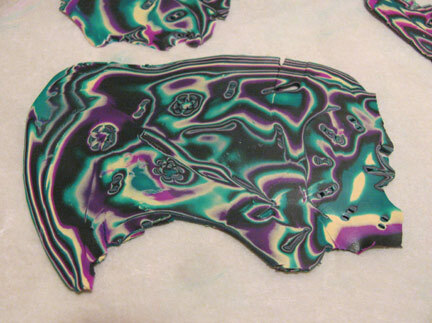 Then I used my long thin razor cutter to slice off thin sheets to expose the patterns. Many of these needed to be rolled out thinner since my cutting isn't very accurate. 2. 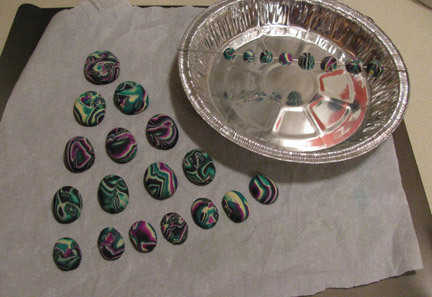 Using scrap clay, I made some cabochon shapes in various sizes. 3. I used the patterned clay to top each cab. See the tear in the front? That had to be patched before baking. 4. 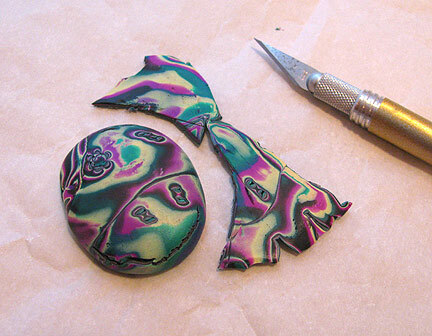 I used every single scrap of clay in this batch. The "leftovers" became a few round beads. Bake per manufacturer's directions. 5. 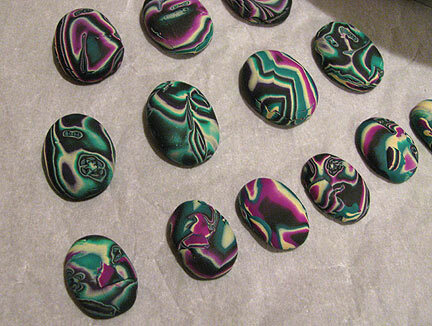 These are some of my cabs, all baked and sanded, but not yet polished. 6. Future Floor finish makes them shine! I like your cabachons. The colors really are great. 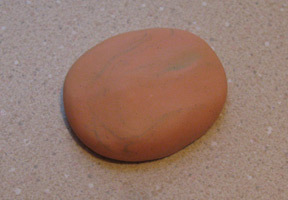 I've got some polymer clay, but have never been happy with what I've made from it. I'll have to check out her book. I'd like to be able to use it and be happy with my creations. Thanks for the review and pics. 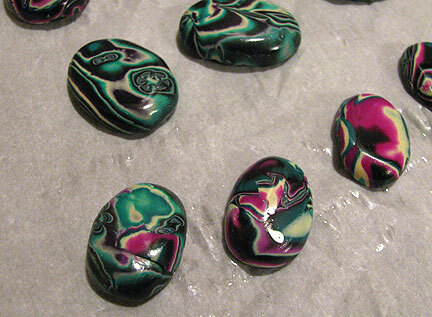 Cyndi, I love those cabochons! The colors are fabulous. I can't wait to see what you make with them. I took a class with Julie a few years ago, and it was fantastic. She's a really sweet person!